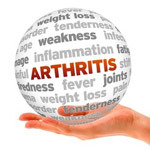 (HealthDay News) -- Arthritis can make cooking difficult, but there are things you can do to ease the strain. Plan ahead for meals to avoid rushing. Make tasks easier by using appliances such as mixers, can openers, dishwashers, microwaves and crock pots. Place a mixing bowl in the sink on a damp cloth to hold it in place, and mix while holding the spoon like a dagger. Secure cutting boards with rust-proof nails to avoid slipping. Cut with a French chef's knife. Choose lightweight pans for easier cleanup and lifting. Apply a nonstick cooking spray. Use reachers, cook while sitting on a stool, store foods in easy reach and move items with a wheeled cart.